Easing you luxuriously into style and understated glamour, we proudly bring you the Washington Rope Outdoor Furniture Collection. Whether you’re creating a haven of luxury in the garden, dressing your balcony or patio, or making sure that your outdoor dining experience is the most comfortable yet; be assured that the Washington Rope Furniture Set will fulfill its obligations and then some! Spacious seating, plump cushioning and elegant lines are at the forefront of this unique 5-piece set of the Washington Outdoor Furniture Collection. Dive into the club chair, cozy up on the 2 seater loveseat, stretch out on the 3 seater, and enjoy the long lasting comfort of our dining chair and bar stool. A stylish design ensures that each piece is roomy and solid, while creating a light and airy feel. 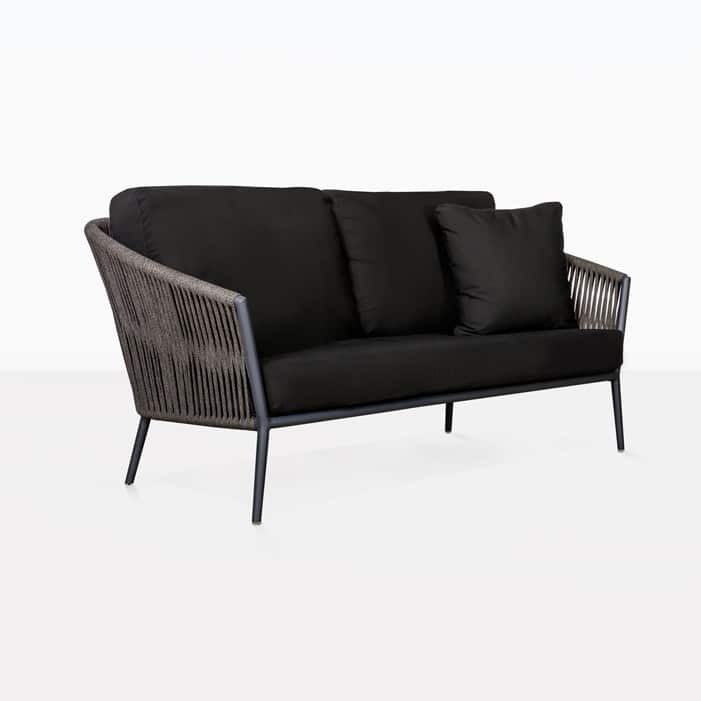 The elegant curvature of the wide arms complements the thick cushioning, which stands out against the beautiful design of the woven rope. The textures are pleasing, the design is outstanding, and the comfort is second to none. Regardless of what you choose, the options are endless with this modern, high-end outdoor furniture set. Imagine watching the sun go down, next to a loved one, while you sip a glass of wine, sighing with relief as you bask in the comfort of the moment on two Washington Club Chairs. Idyllic doesn’t even begin to do justice to the moment. Perhaps your commercial project requires a large patio to be filled with cushy seating? Pair up the Washington Loveseat and Sofa with a couple of Club Chairs with a reclaimed teak coffee table, shade with one of our superb Sunbrella® brollys and watch as your guests take comfort in this attractive and relaxing seating option. Placing 8 of the Washington Dining Chairs around one of our large Raw Concrete Tables will complement a modern home. Just add guests, a good drop of your favourite grape and some delicious food and you’ve got an evening setting to be envied by many. 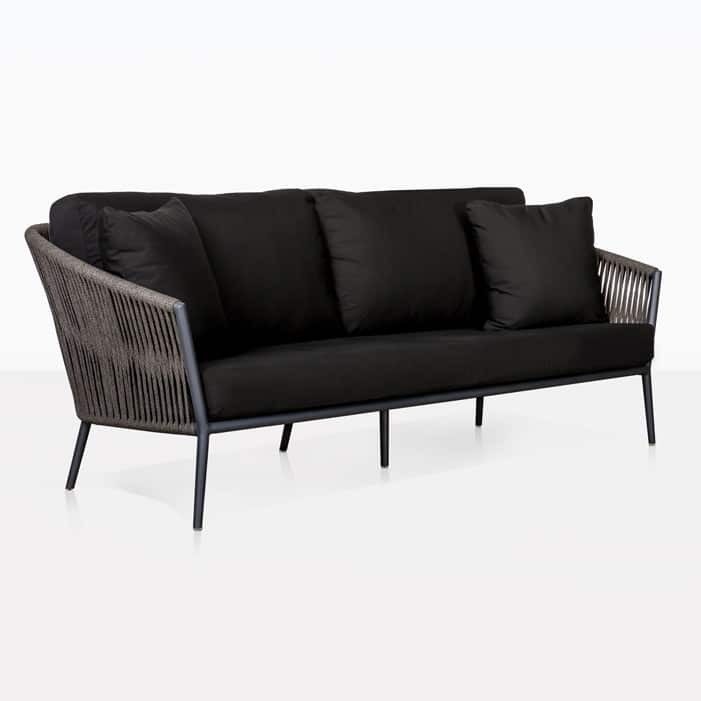 Each piece of the Washington Furniture Collection is expertly crafted on a powder coated aluminum frame, with soft charcoal European outdoor polypropylene rope and topped off with bold, beautiful black Sunbrella® cushions. In this day and age, we know you want quality and something that lasts. Don’t forget the Washington Outdoor Collection comes complete with Sunbrella® cushions as shown, long lasting, comfortable and free with each purchase from the collection. 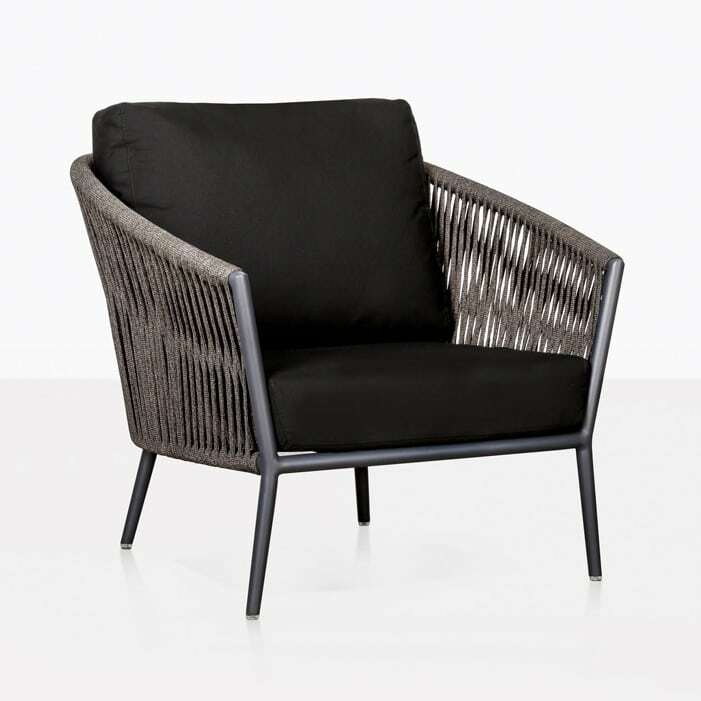 Our Washington Rope Collection is outdoor furniture sophistication at its best. The ultimate amalgamation between modern Scandinavian style and mid century furniture, the Washington outdoor furniture set promises comfort, contemporary style and expert design. Call today to find the best blend of Washington outdoor furniture for your home, office or commercial space! This is a purchase you’ll be thanking us for, for years to come!